I played flute from 1975-77 and was Band Secretary under Mr. Quan. Band and Drill Team Competition was a highlight for us; marching off the Sports Arena floor. We were Northern League Champs. Considering city champs were dominated by privileged Valley schools like Granada Hills and El Camino Real, we made it to the top ranks one year. Great times and lifelong friends. I graduated from FHS in 1990 and was in band for only two years. I was recruited by a brother of a friend to play in the drum line when I was a junior. At the time, I was only playing (drum set) for a little over a year without any formal training; not even knowing how to read music. Within a month, I was playing snare, then before the Highland Park Parade I was playing tenors and writing music for the line. My senior year, I was made Drum Captain and also made All-City Band playing tenors. I ended up volunteering to teach the drum line at Franklin for three years and placed 2nd the last two years at the Band and Drill Team Competitions. Band has been a great experience. Starting with Franklin's band and having Mr. Quan as a teacher was a great starting point for me. If it wasn't for that, I would not be where I am in music. I've been one of the percussion instructors for the Pasadena City College Tournament of Roses Honor Band for the past 19 years as well as PCC's winter drum line. I've marched with the Burbank Lancers Drum Corp., Sacramento Freelancers, The Spirit of Santa Fe Springs and Velvet Knights. I've also been the drum instructor at numerous schools. I've done studio work, drum tech for studios and touring bands. Too many memorable moments to count! I was asked to join band during my senior year. To my surprise, I learned to play the snare drum. Oh how I wished I had joined sooner because it was the greatest experience of my time at Franklin. Playing our pep music in the stands, laughing and cheering with fellow Panthers was something I would never forget. One of my favorite moments was at the beginning of our pep rallies. The band would line up in the tunnel and we'd listen for the whistle. It was our cue for the drum roll and we'd step off on "Virgin de la Macarena" and played as loud as we could in the tunnel. The greatest thing that came out of it all were the friendships we encountered. Who would have thought that a group of so many different individuals would eventually turn into one big family. Like all families, we fought, we laughed, we cried, we loved. That in a nutshell is what being part of the Franklin High Marching Band has meant to me. Now I'm a proud Panther Band Mom and my two eldest sons are Panther Band Members too! I hope in the years to come they too can look back on their experiences and remember how great it was to be part of such a special group. Thank you to Mr. Quan and my fellow Panther Band members! Played snare drum. I remember the countless hours of practice when we first received new drums to play on. We all had grins that measured a mile long. Thank you Richard Quan for your tutelage and dedication and most of all friendship. Played flute. Being in band was one of the most funniest time in high school. I was in band all 3 years of high school. It was hard work getting ready for competition, but well worth it. I still remember going against Locke and Granada Hills High Schools. I also remember when we did the commercial for Franks Nursery. That was a great time. Who could ever forget Mr. Quan and the trick the band would play on him. Being in band was being part of a family. Band alumni's favorite music to play! Homecoming. If you're Franklin band alumni and wish to perform at our homecoming game on October 7, e-mail the band director for more information. Also, please plan on purchasing your ticket to the football game; all alumni need to purchase ticket. Tickets will be checked by personnel working the gates. Fall 2016-See Franklin football schedule for dates and times. May 26- Concert with Burbank Middle School at Burbank Middle School. Performance begins at 6:00p.m. Band call time 5:15 p.m. wearing concert black. April 15- 100th Anniversary Pep Rally during 3rd and 4th periods. Wear this year's band shirt. April 16th (Sat. )- Franklin's 100th Anniversary Celebration. Parade will begin at Monte Vista Elem. Meet at 10:00 am with instrument and in full uniform. April 22 (Fri.)- Powder Puff Game Performance. Call time TBA. April 29 (Fri.)- Spring Concert in our auditorium. Featuring our band, color guard and small student ensembles. Free event. Begins at 6:00 pm. March 12 (Sat. 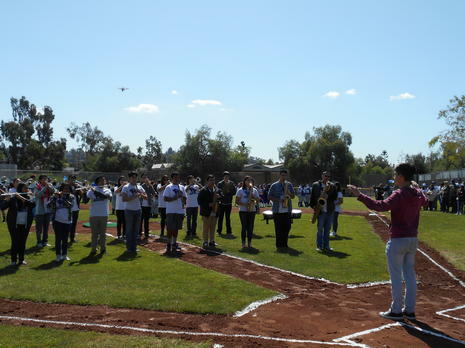 )- Little League Opening Day at Garvanza Park. Wear this year's band shirt. Call time is 10:40 am with instrument. Performance begins at 11:00 am. Wednesday March 2- Open House- Call time 7:35 am. Wear this year's band shirt. Friday, March 4- Open House- Wear this year's band shirt. February 6- Coach Carmona Recognition- Call time 10:15 am. Wear band shirt! February 10- Basketball Game- Call time 3:15 pm. Wear band shirt.